Organic onions & beets enjoying summer. Onion seed is small and dark and disappears right into the soil. I covered what I thought were the seeds with a tiny bit of soil, covered the bed with a fence section and a sheet, went back inside to thaw out and promptly forgot I’d planted onion seed. I knelt down by the bed and was stunned to see a ton of baby grass growing in the bed. I grabbed handfuls and began madly tearing out what I thought were seeds. About 3 minutes later I froze; I was tearing up baby onions! I tend to use sets, now. Raising onions from sets is even easier but your choices are limited to what your favorite, organic seed company is growing. Organic onions love sun and good soil. I prefer red onions so I usually end up with Stuttgart or Candy Red. Both are good tasting, sweet onions but only the Stuttgart is a long keeper. 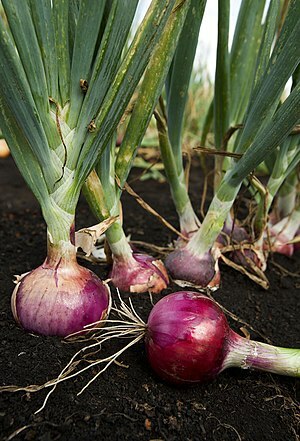 FYI onions like cool weather so you can put seed or sets in the ground as soon as you can work the soil in the spring. If you’re going for sets, the best time to order your sets is early. If you don’t order early, you may not get the varieties you want. Raising onions in the backyard, especially organic onions, is getting more popular and nurseries run out of sets pretty early. 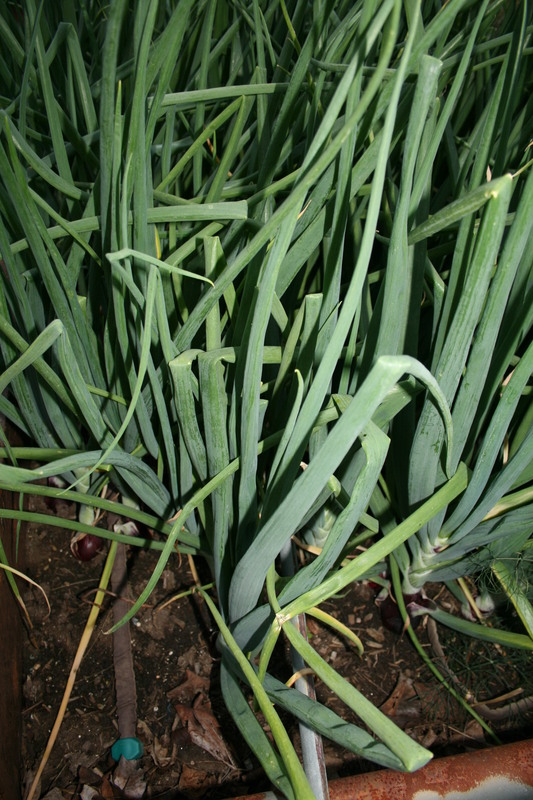 If you are putting onion sets in the ground, most organic companies will ship them to you in the fall and within 2 weeks of the optimum time for you to plant. When the sets arrive, they may appear wilted but they are pretty hardy and should do well if you plant them quickly. NOTE: if you cannot plant as soon as they arrive, just put them in the refrigerator for up to 2 weeks. If planting in the fall, mulch heavily – I use 14 to 18 inches of straw to cover the whole bed. Mulching keeps the plants from sprouting during the January thaw and prevents the freezing and heaving cycle when warmer days play tag with the cold temperatures of deep winter. FYI – Growing garlic is just about as easy as growing onions as I shared in an earlier post. Avoid GMO Food – GROW YOUR OWN! 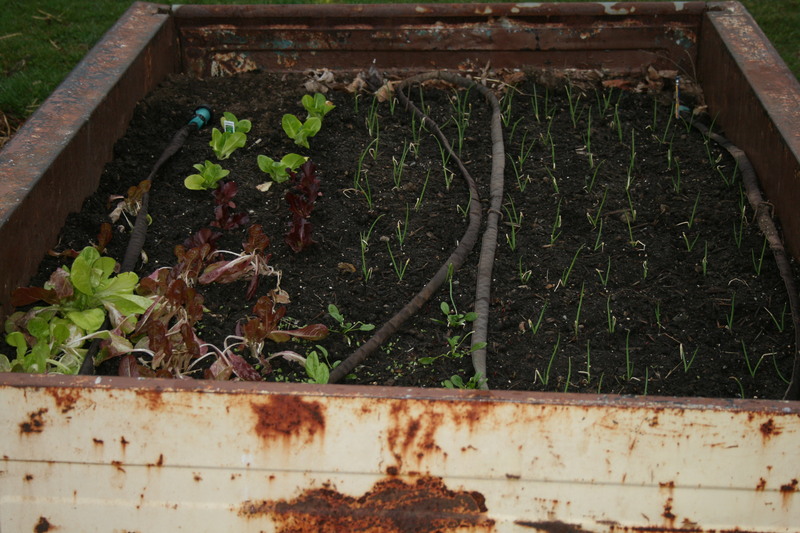 Cool weather and cool raised bed of a 55 Chevy truck making for happy lettuce, spinach and onions. Organic gardening is the easiest, best way to avoid all the GMO foods currently on the market – estimated to be 80% of US food chain. I know – I wrote the book on just how easy it is to get going and get growing. And I share tips and tricks on how to raise just about every possible vegetable and fruit you can find in the store (well, no kiwi, avocado or olives – too cold here). Now, another doctor adds his voice to the growing chorus of educated, intelligent people who just don’t want to eat “frankenfood” that is definitely affecting our health and our children’s health. Grow lettuce. Try blueberries – in pots or the yard. 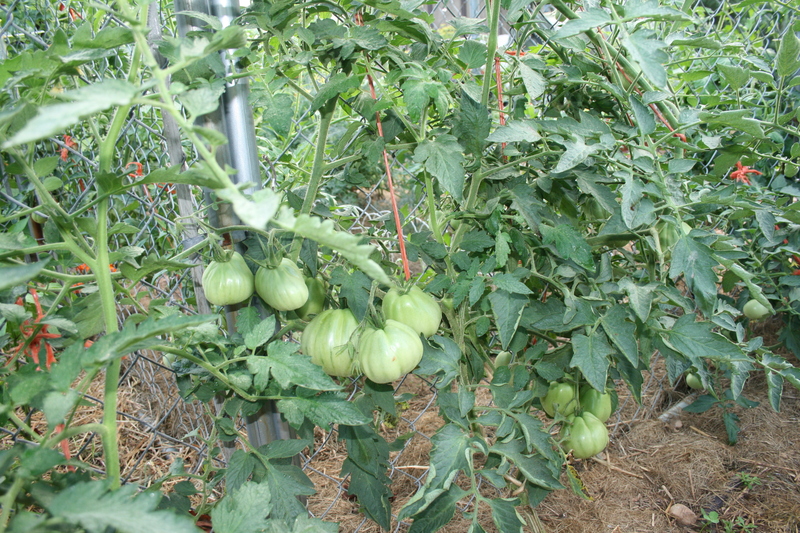 Heirloom tomatoes on the vine in my backyard just weeks away from picking! Add tomatoes and peppers. And start being sure where your food has been and who it’s been hanging out with. Share your ideas, your recipes and your success stories with other gardeners – just step out onto your patio or into your yard and start down the path to healthy food, health eating and healthy lives. It is…oh so easy! I love gardeners who love what they’re doing so much that they take the time to share information, advice and stories with other gardeners, even if it is all about fall clean up. Kaye Kittrell is one such gardener. Kaye is a member of my LinkedIn group – Grow Girls Grow Organic. And Kaye makes the most wonderful videos about her gardening experiences. Kaye wraps up all the lessons she learned this past year about aphids, powdery mildew and cabbage worms. One quick tip for her and other gardeners: to kill cabbage worms, get an old-fashioned flour sifter, put some flour in it and head to the garden early in the morning. Make sure you get to the worms while the dew is heavy. Sift flour on the plant and worms and watch the sun dry them into papier mache worms! When it rains, the flour washes right off. My mom’s tip and it works like a charm. Professionally shot and edited, these videos are fun to watch and always teach this old gardening girl something new. So, I thought I would share! Enjoy this wonderful, warm weather gardener’s adventures in dirt, especially here in the Mid-Atlantic where we are currently sitting under about 10 inches of snow and 1/4 inch of ice…all delivered in the last 7 days. Late Bloomer – Summer Garden Wrap-up – Episode 2.19 – YouTube. via Late Bloomer – Summer Garden Wrap-up – Episode 2.19 – YouTube. On her blog, this week, A Way to Garden, Margaret Roach asks where all the Monarch butterflies have gone. I fear I must confess. I think many of them came to my house for the dill buffet that is growing in one of my raised beds. Dill with a side order of Monarch butterfly larvae. I didn’t raise dill just for them. In fact, I let my dill self seed. This year, two big dill plants on the ends of my raised beds came and went and left a ton of seeds on their umbrels. I saved about 5o seeds so that next year, I could plant the dill where I wanted it to come up and never thought a thing about the other 500 seeds that the big plants had dropped to the ground. Monarch larvae side by side in my dill. Then, about 6 weeks ago, I noticed a forest of tiny, soft dill fronds sprouting up in the ground where the old plants had been. I thought about pulling them up but then I noticed butterflies landing on the plants and I wondered if they were laying eggs. They were. On this sunny, September afternoon, there are dozens and dozens of larvae, mowing down dill and contemplating when they want to pupate. I expect to see a whole bunch of yellow-green chrysillises in the spring. Monarch butterfly larva in the dill. So here, in eastern Pennsylvania, I am doing my bit to help Monarchs flourish. I left the dill and I have planted a bed of milkweed, one of the butterfly’s favorites. But I know that these butterflies are suffering. So, here is Margaret Roach’s expert on Monarchs, their plight and what all of us can do to help. precarious time for monarchs and their migration – A Way to Garden. This is an absolutely glorious article on the NY Times site with links to gardening aps for your phone!! It was posted by one of my LinkedIn group (Grow Girls Grow Organic) members — Cindy Meredith. Meredith also has a gardening blog and it is packed with great info on all kinds of gardening so I expect great info but this post and link just made me smile! Happy Easter to all my gardening friends. Digging in the Dirt With Gardening Apps – NYTimes.com. via Digging in the Dirt With Gardening Apps – NYTimes.com. Margaret Roach does it again! 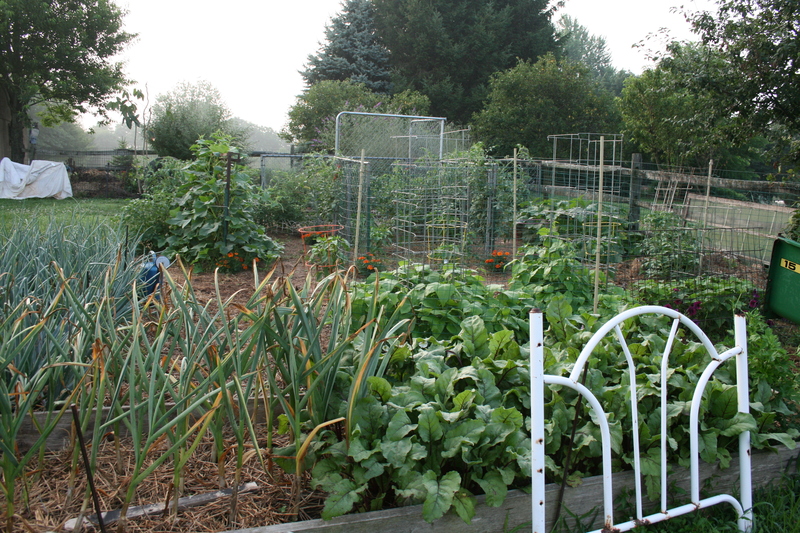 And while I am working on my organic gardening manuscript…. 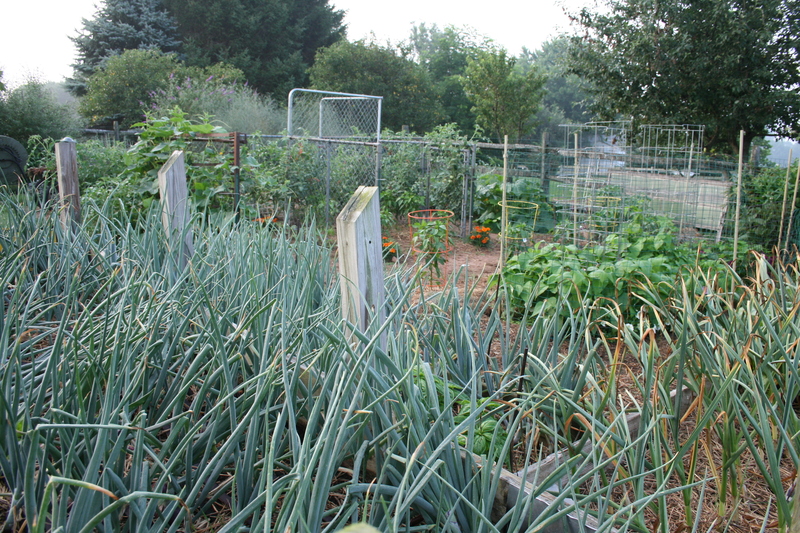 I thought I would share links and articles from some of my most favorite organic gardeners. This article is really an in-depth FAQ on mulch. What really constitutes mulch? How much should I use? When do I mulch? Got mulch questions? Ms. Roach has the answers. garden mulch: how to mulch, and what to use — A Way to Garden.